ITALY: Falck Renewables, the London-based wind development unit of Italy's Falck group, has closed a €150.5 million project financing deal for its 79.5 MW San Sostene wind farm in the southern Italian region of Calabria. 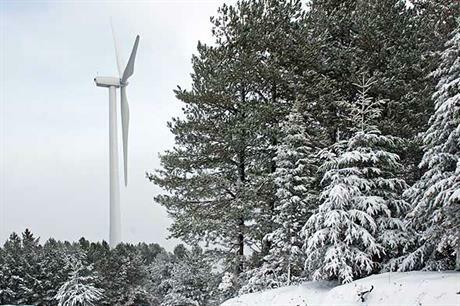 A winter view of a 1.5 MW General Electric turbine at the Falck Renewables San Sostene wind farm in Calabria, currently operating at 42 MW. Led by Italy's Efibanca, the deal is also being financed by Italian financial institutions Banca Infrastrutture Innovazione e Sviluppo, MPS Capital Services Banca per le Imprese, Centrobanca, and Agrigleasing, along with the UK's Barclays Bank. The first 42 MW of the project has been operational since November and is composed of 28, 1.5 MW turbines from U.S. manufacturer General Electric. The 15, 2.5 MW turbines from German manufacturer Nordex for the project's second phase are currently being installed. The wind farm is expected to produce 180 GWh of electricity annually.